After a week of waiting for Chanel Fall to be released on chanel.com, I gave up and headed toward Neiman Marcus instead. I'm not usually loyal to a particular medium of purchase, but I really want to have a look at Brumes d'Or and the online site is the only way I have access to the product (and I'm trying to get to $100 for free shipping). They're usually so much better about releasing collections online, so color me perplexed that it's taking them this long. I only swatched Vertigo and Frenzy because I wasn't interested in another fuchsia berry (Suspicion) from Chanel, and once on my finger, I also lost interest in these two. While nice, I was hoping for microshimmer in the polishes because that's when Chanel truly shines, and in keeping with my new resolution to pare down, I'm trying to ignore my grabby hands impulse and stop settling for just "nice." The only thing I know I really want from this collection right now is the Extrait de Gloss in Troublant, a plummy rose with hints of brown that looks like the fall edition of my lips, as in if my lips (naturally) changed colors with the seasons it will look like that. I was most excited to see Lumière d'Artifices Beiges and Joues Contraste Rose Initiale, but so far my response to them is lukewarm. 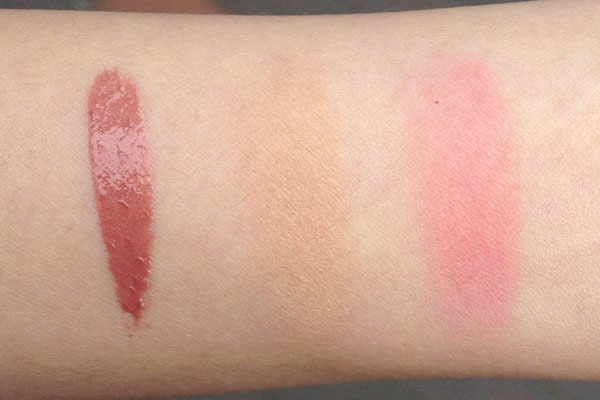 They reminded me of shades from the Le Metier de Beaute Blush Kit. I compared the 3rd shade of the Blush Kit to Lumiere d'Artifices and found that the former more gold and shimmery. 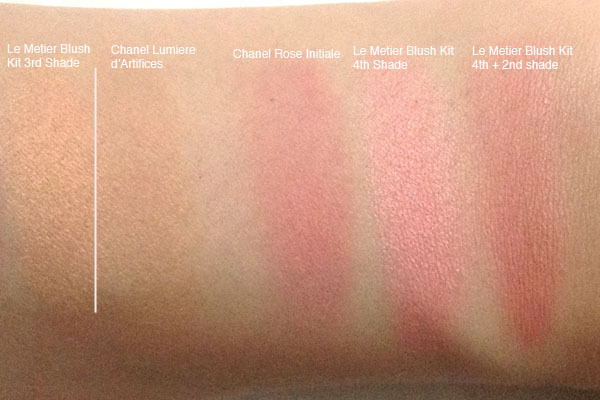 Rose Initiale is similar to a mix of the 2nd and 4th shade of the Blush Kit. That said, since they're not complete dupes I'm still considering the Chanel pieces. As usual, Sabrina of The Beauty Look Book is on point with her Chanel coverage, so head on over to her blog for her thoughts and comparisons. 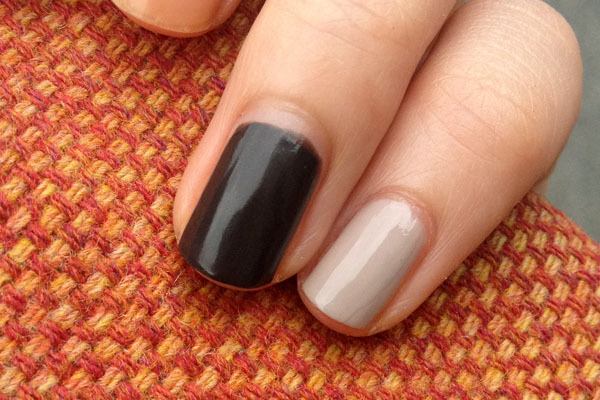 Yeah, none of these polishes speak to me, which is good, considering the "cutting down" mentality. Good for you, Xiao! :D I do like Troublant (and your description!) but I'm not sure I could pull it off. rebecca- I sort of swore off Chanel shadows :x unless a really unique color/variation comes along, I told myself not to get any since i never use them. Liz- Aww yeay :) I learned from the best! xiao, just a note - I was on Chanel's site earlier and the fall collection is now available. I think I've talked myself into a rouge coco, the extrait de gloss, and the blush. Maybe. I'm still on the fence about the blush.